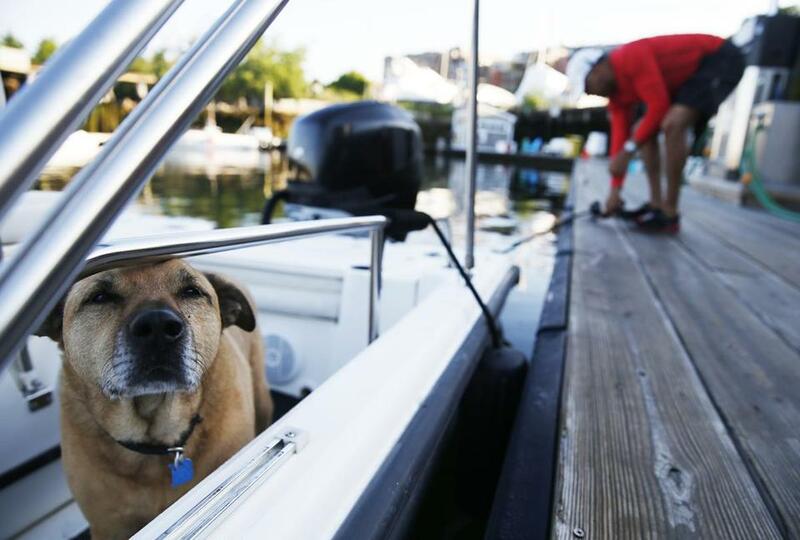 Maury Collins’s dog Tango kept an eye on the boat as Collins tied it to the dock while he waited for a renter from a peer-to-peer boat sharing site called Boatbound to arrive. The first time Maury Collins rented out his boat to a stranger, he stood off in the distance and waved goodbye. Now, after renting it about 10 more times, Collins no longer feels like he’s having a heart attack. 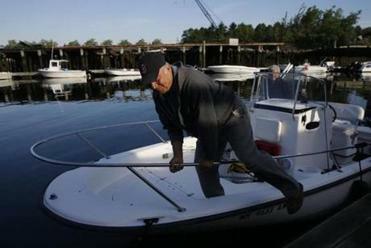 “Just a minor stroke,” said the Brighton resident, who docks his 22-foot Boston Whaler in East Boston. Collins, 44, is among the growing number of boat owners signing up with peer-to-peer boat rental companies, a relatively new but rapidly expanding sector of the sharing economy. Think of it as the Airbnb of boats. Peer-to-peer boat rental companies such as Boatbound, Boatsetter, and GetMyBoat, all founded within the last three years, connect renters to an array of watercraft, from inflatables to mega yachts, in various coastal areas around the country and the world. They have been increasing their reach and presence in the Boston area, making the region among the most competitive in the industry. Boston is Boatbound’s fastest-growing market nationwide, with boat listings up 280 percent since last summer, according to the Seattle-based company. Overall, Boston is Boatbound’s fifth largest market, but it could surpass Seattle for the No. 2 spot by next year, said Chris Fox, the company’s fleet director. Peer-to-peer rentals differ from boat clubs where members pay thousands of dollars in entry fees and monthly dues in exchange for access to the company’s entire fleet. Freedom Boat Club, for instance, which has several locations in Massachusetts, has an entry fee of $5,900 and $349 in monthly membership fees year-round that entitle members to use boats in warmer climates during the winter. Boatbound was founded in 2013 and entered the Boston-area market the following year. Fox said the company has experienced about 350 percent growth in listings year over year and will soon be profitable. Boatbound and services like it persuade boat owners to rent their expensive craft to complete strangers by offering potentially thousands of dollars in rental revenue, as well as insurance policies that protect both owner and renter. Collins said the insurance, as well as a user-friendly website, persuaded him to list his boat on Boatbound so he could make a bit of extra cash on the days he’s not using it. Last summer, he had about eight bookings, netting him around $2,400. “At the end of the day that’s what we’re all after, is to help offset the cost of the boat,” Collins said. Taso Sideropoulos, 76, got into Maury Collins’s boat, which Bob Sideropoulos rented, as they prepared to take off for a day of fishing. Bob Sideropoulos of Pembroke used Boatbound to rent Collins’s boat on Father’s Day for a day of fishing with his father, his son, and a friend. The 50-year-old said he has been boating for 30 years but sold his own Boston Whaler about five years ago to buy a pizzeria. Boatbound “is great for people like me who are in between. Before I get another boat, it’s perfect,” Sideropoulos said. With peer-to-peer services, boaters are able to set their own rental rates — which, on Boatbound, for instance, range from $60 a day for an 8-foot inflatable dinghy to $12,000 a day for a super yacht with a crew of six. Insurance is included in the price of the rental. The companies take a percentage of the rental fee, in Boatbound’s case 35 percent, while Boatsetter gets 20 percent. With the average boat owner using his or her boat just 12 to 14 days a year, renting makes financial sense. Jaclyn Baumgarten, chief executive of Florida-based Boatsetter, said peer-to-peer boat sharing is appealing to a younger demographic of Gen Xers and Millennials, which is good news for an aging marine industry that hopes boat-sharing can stimulate boat sales, Baumgarten said. The average age of boat owners is 55, she said. The US recreational boating industry recently reported that new powerboat sales were up 8.5 percent last year compared with 2014. Massachusetts powerboat sales were more than $250 million last year, up 11.5 percent from 2014, according to the report. Boatsetter, which launched last year, gives users the option of requesting US Coast Guard licensed captains as part of their rental. The company is starting to expand locally and has partnered with Cape Ann’s Marina Resort in Gloucester to recruit boat owners and captains. Kira Maixner, head of digital communications for GetMyBoat, said the Boston area is “one of our hot ones,” its fifth-largest market. Launched in San Francisco in 2013, GetMyBoat has 58,000 boats in 7,100 locations listed on its site, as well as Android and iPhone apps. Matt Carrick, co-owner of 10 Freedom Boat Club franchises in Massachusetts, said he is not concerned about the rise of peer-to-peer boat sharing. His locations have about 800 members, with membership growing about 20 percent a year for the past three years, he said. Collins, who rented out his boat on Father’s Day, said he believes boat sharing will catch on.